We specialize in large diameter bar stock, but grinding can be added to any turned or cold drawn bars in sizes from 0.158” (4mm) to 16” diameter to ensure superior finish, tighter than industry standard size tolerances, and superior straightness. We are able to provide size tolerances as stringent as .0002” total with surface finishes of 12 Ra or better. 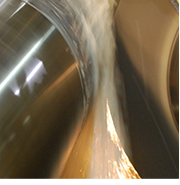 Northlake Steel can grind carbon, alloy, stainless, and tool steels; ceramic and laser clad coatings; and other exotic materials in lengths up to 75’ long.